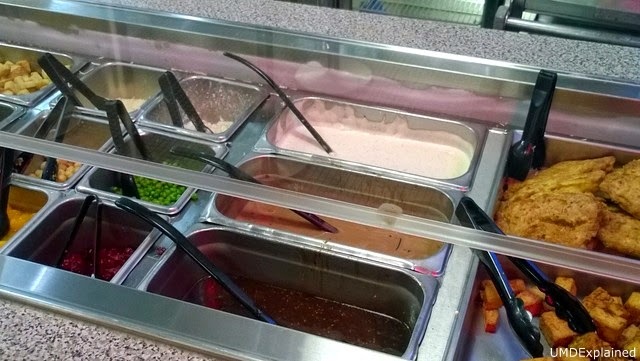 The diners at UMD serve a variety of food. There are at least 10 types of cereal to choose from. 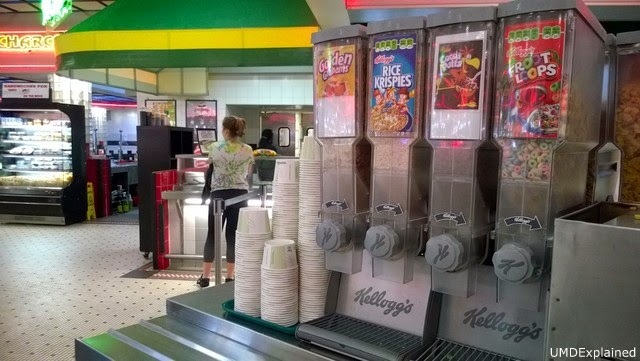 The cereals selection changes, but Honey Nut Cheerios and Special K Red Berries cereal seem to be offered daily. Other cereals served include Froot Loops, Raisin Bran, and Lucky Charms. 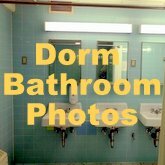 You can make peanut butter and jelly sandwiches (left side of photo). There is also a breakfast pastry/cookie case. There are donuts, croissants, bagels, and cookies to choose from. There's a big toaster (not pictured), so you can toast your bagel or bread if you want. Cookies offered include chocolate chip, white chocolate macadamia, and m and m.
There's a make your own waffle station. 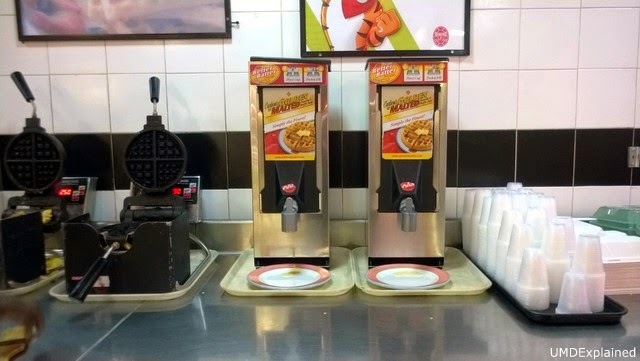 You take a plastic cup from the right, fill it up with waffle batter (fill 80-85% of the cup), then dump it into a waffle iron. The iron has a built in timer which will tell you when your waffle is done. There is whipped cream, melted butter, and strawberry topping to garnish your waffle. 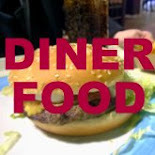 There is a station at the North Campus diner that rotates weekly. This week, it was Sensational Salads. In the South Campus diner though, this is a permanent station. You first pick your greens. There's spinach or spring mix or iceberg lettuce. Then you can add in couscous, pesto bow tie pasta, broccoli, croutons, red peppers, and/or green beans. There's also chickpeas, craisins, clementine segments, parmesan cheese, feta cheese, and peas to add on. 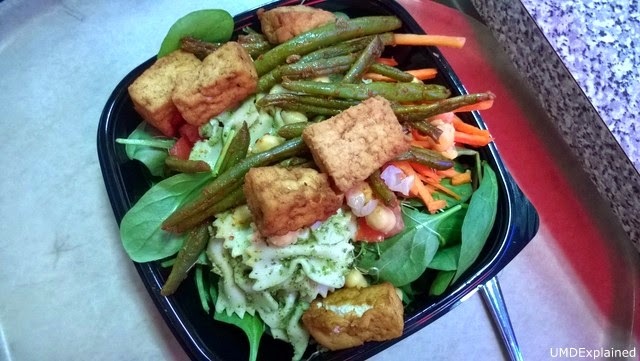 Usually, they have beef or chicken as the protein for the salad. But this week, it was a special, so fish and tofu was offered. There's ranch, balsamic, and sesame dressing to choose from. Here's how a sample salad looks like. At sensational salads, they charge a set price. At the salad bar, it's per ounce. So make sure to take advantage of this! 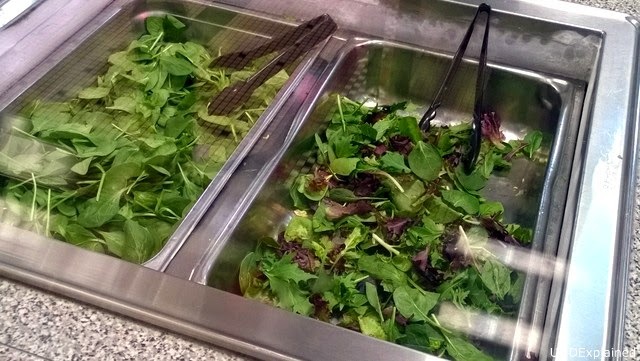 Note: In South Campus, the salad toppings rotate weekly. Sometimes instead of couscous or pasta, they have rice. And instead of chickpeas or green peas, they might have olive and mushrooms. 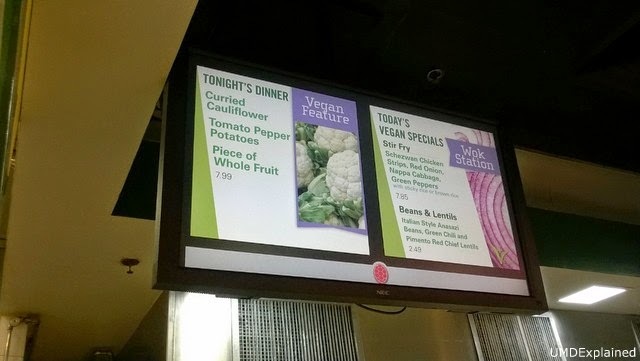 There's a vegan station called Sprouts at the North Campus diner. They offer a vegan dinner that changes nightly. And they usually offer a stir fry of some sort. 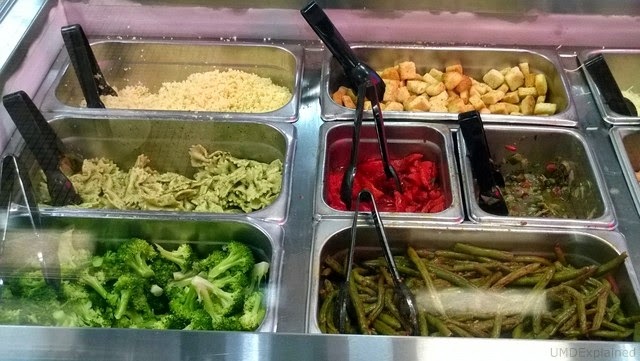 You can also assemble some veggies from the salad bar and ask them to stir fry it for you (no meat in it though!). 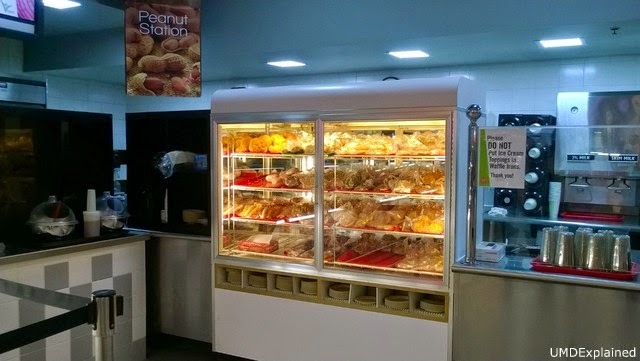 If you do want meat, you can go to the burger station and ask for a piece of grilled chicken breast. 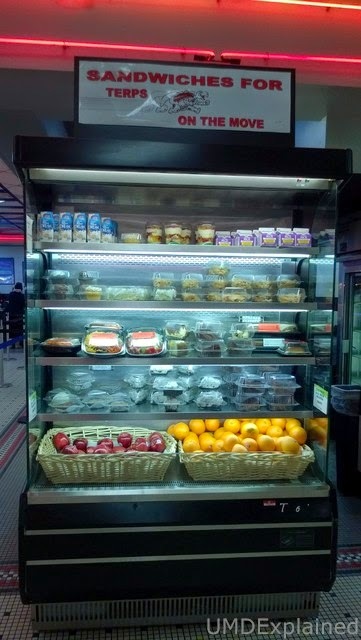 If you're in a rush, you can grab a prepackaged salad, sandwich, or wrap. 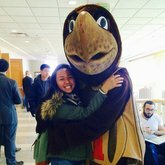 They have buffalo chicken wraps, caesar salad chicken wraps, bbq chicken salads, egg plant naan salads, cobb salad, and more. 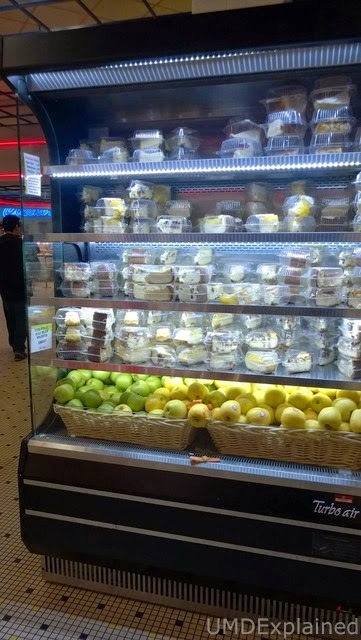 Apples and oranges can be found in these display cases. There's vanilla cake, coconut cake, chocolate cake, apple pie, cherry pie, carrot cake, lemon meringue pie, oreo cream pie, plain cheesecake, cheesecake with strawberry topping, cheesecake with lemon topping, cheesecake with blueberry topping, and cake trifles to choose from. They have vegan and gluten free cake options to choose from as well. 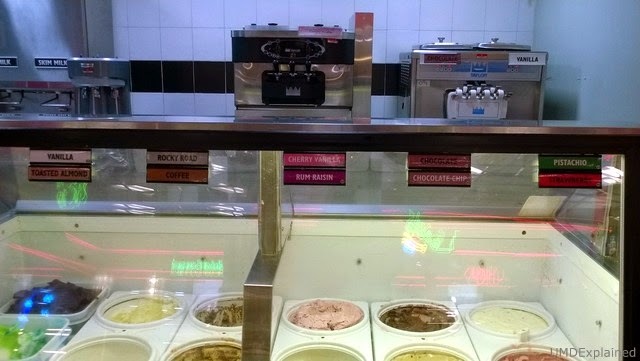 And if that doesn't satisfy your sweet tooth, there's ice cream, soft serve, milkshakes, and frozen yogurt as well.